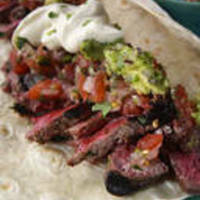 Use for skirt or flank steak. Combine marinade ingredients and pour over the beef. Cover and refrigerate 8 hours, or so. Drain and discard marinade before grilling. This sounds nice. Maybe could give it a try.